Dr. Tess Coleman (Jamie Lee Curtis, "Halloween") and her fifteen-year-old daughter Anna (Lindsay Lohan, "The Parent Trap") are not getting along. They don't see eye-to-eye on clothes, hair, music, and certainly not in each other's taste in men. One Thursday evening, their disagreements reach a fever pitch - Anna is incensed that her mother doesn't support her musical aspirations, and Tess, a widow about to remarry, can't see why Anna won't give her fiancé (Mark Harmon, TV's "Chicago Hope") a break. Everything soon changes when two identical Chinese fortune cookies cause a little mystic mayhem. On the next morning, their Friday gets freaky when Tess and Anna find themselves inside the other's body. As they literally walk a mile in each other's shoes, they gain a newfound respect for the other's point of view. But with Tess's wedding coming on Saturday, the two have to find a way to switch back, and fast! Download Freaky Friday in Digital HD from the iTunes store. Freaky Friday images are © Walt Disney Pictures. All Rights Reserved. Step into a "Freaky" time with this 2003 remake of Disney's classic Freaky Friday. This time the daughter is played by the up and coming star, Lindsey Lohan, and her mother is played by the wonderful Jamie Lee Curtis. Anna Coleman and her mother, Tess, never seem to understand each other. They both seem to always shout instead of speak to each other, and they never seem to get along. If only they could step into each others shoes and understand what the other is going through? Well, on the Friday before Tess's wedding, all of these things are about to change with a magical fortune cookie. The resulting chaos of having Tess in Anna's body and Anna in Tess's body is pure joy. However, at the end of the day both come to understand each other and have a closer relationship. The movie is perfect in everyway. The soundtrack is very hip with very catchy songs (and even has one that is performed by Lohan herself). The performances by Curtis and Lohan are out of this world, and will have you laughing out loud (I know I did!). 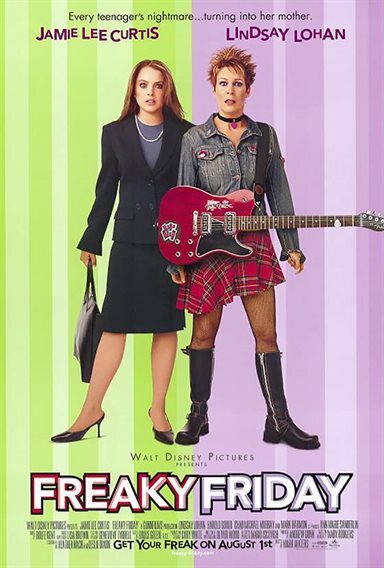 Freaky Friday is directed by director Mark S. Waters who also directed Lohan in another teen comedy, Mean Girls. Disney has produced an outstanding DVD version of Freaky Friday. The picture quality is unbelievable and color tones are in perfect order. The DVD contains deleted scenes, an alternate ending, bloopers, two music videos, and a backstage set tour with the delightful Lindsey Lohan. Freaky Friday images © Walt Disney Pictures. All Rights Reserved.